Lawo is set to launch a major release of IP broadcast products at BVE 2019, adding to its IP solutions portfolio, as well as a complete remote sports production set up. The set up will comprise on the remote side the Power Core Remote Audio Mixing Engine, the WAN-capable A__line AoIP interfaces, and the V__remote4 video-over-IP contribution solution. On the broadcast production side, Lawo will demonstrate the V__matrix Software-defined IP-Routing, Processing & Multi-Viewing Platform, the Smart System Monitoring and Realtime Telemetry for Broadcast Networks and the new mc²56 third generation production console including the A__UHD Core ultra-high-density network-based, software-defined audio DSP engine. Furthermore, the set up will include Kick, the Bundesliga-approved automated mixing control for close-ball mixing. Kick is the ball tracking technology for close-ball audio pickup for sports such as soccer, rugby and American football. The system provides transparent sound and excellent ‘kick-to-noise’ ratio, significantly reducing crowd noise. It also ensures a consistent audio level without noticeable fades for seamless inclusion in a broadcast mix, delivering a mix that is repeatable from match to match and remains highly accurate even after 90 minutes of play. Responsible for producing all Bundesliga football matches, DFL (German Football League Association) subsidiary Sportcast has been using Kick in sports production since the 2017/2018 season for live tracking of the players to optimally control the microphones that record the action on the playing field and mix the sound. The V__matrix ecosystem is based on generic high capacity FPGA-based processing blades upon which software-defined virtual modules (VM) are loaded to create the functionality required. The range of VMs include the vm_dmv64-4 – which it claimed to be an infinitely expandable true IP multiviewer and the vm__UDX – 4K format converter. Multiple cores are connected through redundant 40GE (or 4x10GE) Ethernet interfaces to an IP network to form a distributed IP routing and processing matrix that provides frame-accurate, clean switching just like a legacy baseband matrix. Lawo’s Smart range includes the smartDASH System Monitoring and Realtime Telemetry, vendor-agnostic enterprise software for network and media visibility across an all-IP, all-SDI or hybrid WAN/LAN broadcast infrastructure, and the smartSCOPE Deep Packet Inspection & Network Analyzer, a media-agnostic, high-density 24/7 analysis platform for IP flows in live production and delivery. 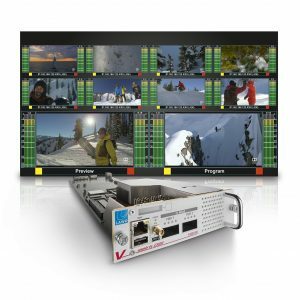 The new mc²56 (third generation) is optimised for today’s IP-video production environment – providing Lawo’s revolutionary LiveView thumbnail previews of video streams directly in the fader strip – and is designed from the ground up for networking in complex production infrastructures, with full native support for SMPTE 2110, AES67 / RAVENNA, DANTE and MADI audio streams. A__UHD Core is a network-based, software-defined audio DSP engine; its ultra-high processing density with >1,000 fully featured mc² DSP Channels can either be utilised by a single mc² console for coping with even the most challenging productions or be shared amongst up to four consoles. Altogether, eight independent 10/1GbE network interfaces with SFPs enable the use of redundant networks via ST2022-7 seamless protection switching (SPS). A__UHD Core‘s total network I/O capacity equals 40,000 48kHz/24bit audio channels. For management the unit provides two redundant RJ45 1GbE management ports. The Power Core is a native IP Audio I/O & DSP remote production node with on-board WAN-capability, providing low-latency on-site audio processing for monitoring and IFB mixing. The powerful 1RU device features 48 processing channels, and it allows remote control of all relevant channel parameters (Gain, Fader, Mute, EQ, Dynamics, Aux Send Level, etc.) from mc² consoles. Its touch-screen-optimized control GUI serves for additional on-site and remote operation. Power Core provides network-link redundancy via SMPTE 2022-7 Seamless Protection Switching.